I did not grasp at first glance the joke in today’s Sunday Bizarro comic in the Tulsa World. Then I realized the driver’s windshield was a giant lens. But there is an optical mistake in the comic, one which we might kindly assert was made by the driver: he is truly bizarre and should be cited for using the wrong corrective lens in his windshield. The last thing the driver would want is an enlarging lens. Yes, elderly people often are seen using lenses which make their eyes look larger than normal, but that is due to presbyopia, the hardening of the crystalline lens in the human eye. The focusing muscles can no longer flex the lens enough to focus on near objects, allowing the focal point to fall behind the retina, causing a blurry image. A converging lens is used to shift the focal point onto the retina for a sharp image. The same is true for people who are farsighted before their lenses become inflexible. The images of nearby objects form behind the retina because their eyeballs are simply too short to match their cornea and lens effects. So again a converging lens is used to help them out. The side effect of using a converging lens in spectacles, which sit some distance in front of the cornea, is that the reduced field of view creates enlarged images. So the concavoconvex lenses create a similar effect one sees with the classic double convex “magnifying lens”: it makes nearby objects appear enlarged and, since light is reversible, makes your eye look larger from the viewpoint of whatever nearby object you are sighting. Below are the six basic lens shapes. The three lenses on the left are converging lenses. Notice how they are all thicker in the middle than at the edges. Spectacles and contact lenses for farsighted people and those suffering from presbyopia use the positive meniscus or concavoconvex shape. The three lenses on the right are diverging lenses, thicker at the edges than in the middle. Spectacles and contact lenses for nearsighted people use the negative meniscus or convexoconcave shape. 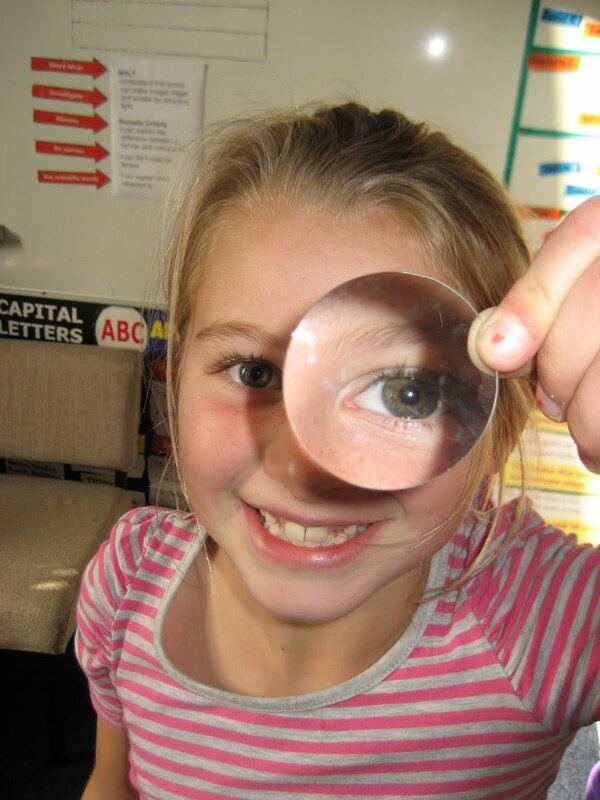 Notice how the girl’s eye in the photo is enlarged. She is holding up a double convex converging lens, so anything nearby she looks at will appear enlarged and, since light is reversible, to us her eye looks enlarged, like the effect seen in the windshield in the comic. But when you look through a windshield you are always sighting distant objects. Presbyopia and farsightedness are not problematic in that case. If the driver, like me, needs vision correction to drive then it is to focus on distant objects. That means he is near-sighted because his eyeball is too deep. 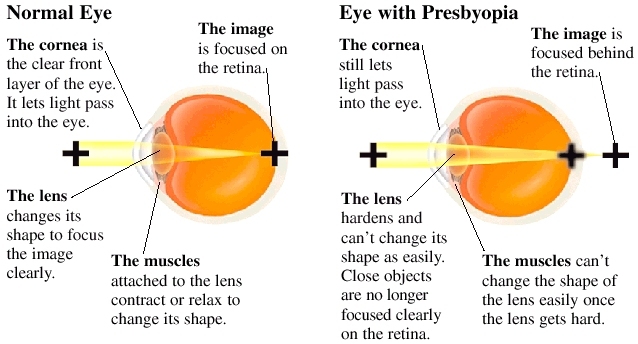 The cornea and lens of the eye converge the rays too much, so that the focal point occurs in the aqueous humour in front of, rather than on, the retina. 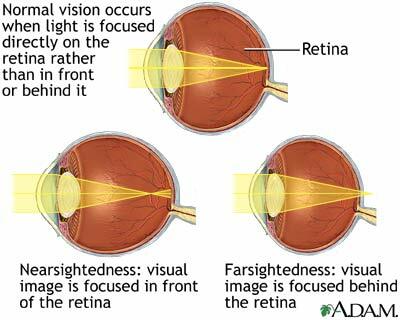 So near-sighted deep-eyeball folks wear diverging lenses which spread the light rays out so that they focus farther back: on the retina. A diverging lens widens the field of view, so it makes more of your face visible through your spectacles than normal and decreases the apparent size of your eyes, making things look smaller than normal. So if I look beady-eyed I can blame the convexoconcave lenses I must wear. 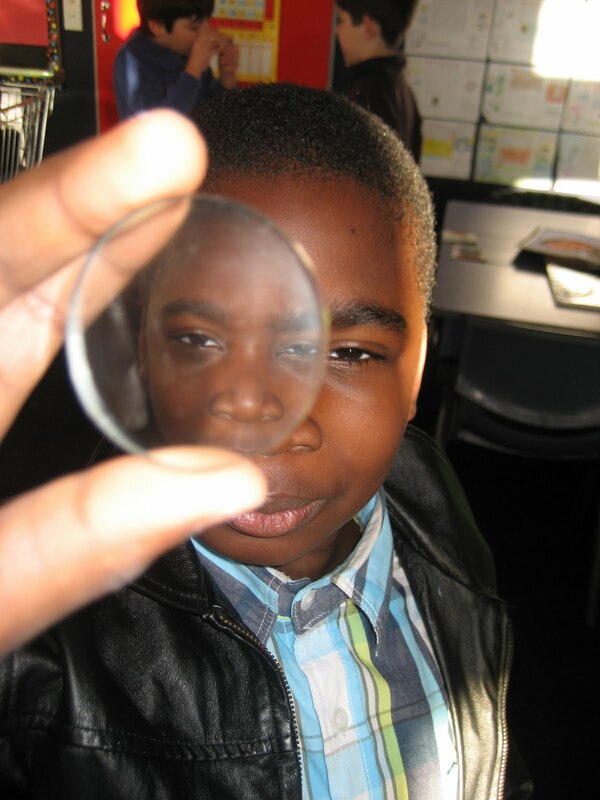 The fellow in the photo is holding a diverging lens up, and you can see how his eye looks smaller than normal. The wide field of view gives us a double image of his nose and other eye as well. I’m old enough to also suffer from presbyopia, so I wear bifocals. The upper part of each lens is convexoconcave to diverge the light rays from distant objects to focus deeper in my eyeball on my retina, while the lower part of each lens is concavoconvex to converge the light rays from near objects to focus closer in rather than behind my retina. I chose progressive lenses to make the transition between the shapes less optically noticeable – to hide the “line” one sees with traditional bifocals. The resulting complex lens shapes makes grinding such lenses much more difficult and expensive, but I’m vain enough to pay for it. Notice how the driver in the Bizarro comic is squinting. This is an adaptation we nearsighted people learn. Squinting reduces the aperture size and, like a pinhole camera, improves focus. So the squinting of the driver is confirmation of his nearsightedness and that he should definitely not be using a concavoconvex windshield. He needs to get a convexoconcave one. Reverse the meniscus! This is not the first time I’ve noticed optical errors in pop culture. Back in 1994 the third single from Meat Loaf’s Bat Out of Hell II: Back Into Hell album, penned as usual by Jim Steinman, was Objects in the Rear View Mirror May Appear Closer Than They Are. Clearly Steinman was thinking of the safety warning on passenger-side automobile mirrors that, “Objects in the mirror are closer than they appear.” The warning reminds you that the mirror is designed to reduce the driver’s blind spot by diverging the reflected light to widen the field of view. But diverging mirrors, like diverging lenses, reduce the image size. Since we judge the distance to an object in part by its apparent size, the reduction in image size can fool you into thinking a car is farther back than it really is. But notice that Steinman’s lyrics are the opposite of how car mirror optics actually work. The song says objects may appear closer than they are, but in fact the mirrors we use on cars make objects appear farther than they are. Steinman got the grammar wrong – again, perhaps it was deliberate, but I doubt it. I won’t suggest requiring physics and grammar for all songwriters and visual artists: we’ll grant them the artistic license to do as they wish to make us laugh…or cry. This entry was posted in funny, physics. Bookmark the permalink.